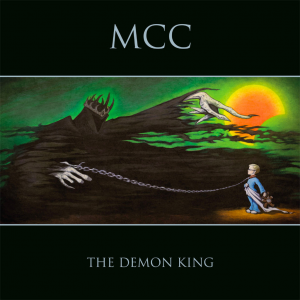 MCC släpper en ny singel “The Demon King” 31 Mars 2017! På Lövely Records. EP:n “The Demon King” släpps 5:e Maj 2017. The song is an open letter from someone tired of being in the claws of the Demons, and that now tries to reach out directly to their leader – The Demon King. Well – a lot can be said about that, but in the end, the one writing the open letter seems to understand that the Demons have made him one of them – full of scare, hate and spite – and that he is now becoming a Demon for others – maybe to one day turn them into Demons too. So, easy to say – this is not a love song. Now, for all you grown ups and the ones aspiring to be: In the real world in which we sadly happen to live; beyond metaphors and fairy tales, the Demons’ name is of course Anxiety and OCD. Flaws or old remnants of signals in our human system that tells us of danger and fear – where there sometimes is none. It feeds itself. And one helps, everyday, to make the Demons or rather the Cognitive Patterns to get stronger. For those of you who are not familiar with OCD and Anxiety in general it can be described as praying to an entity you don’t even believe in. By carrying out rituals that serve no point other than to make you feel like you are free of guilt and responsibility, often for things you have nothing to do with or can change, you slowly, several times each day cleanse yourself from sin. Much like religion at times, only with OCD you often don’t have a name for your God of Fear and Shame. For us though, this God is Called ”The Demon King”. Listen. Or, if you need to – sing it. Icona Pop släpper ny singel – exklusivt för Sverige!